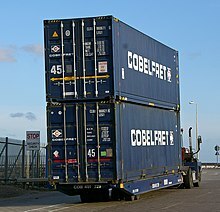 Intermodal containers exist in many types and a number of standardized sizes, but ninety percent of the global container fleet are so-called "dry freight" or "general purpose" containers, durable closed steel boxes, mostly of either twenty or forty feet (6.1 or 12.2 m) standard length. The common heights are 8 feet 6 inches (2.6 m) and 9 feet 6 inches (2.9 m) – the latter are known as High Cube or Hi-Cube containers. 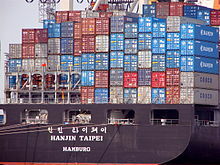 In 2012, there were about 20.5 million intermodal containers in the world of varying types to suit different cargoes. [nb 2] Containers have largely supplanted the traditional break bulk cargo – in 2010 containers accounted for 60% of the world's seaborne trade. The predominant alternative methods of transport carry bulk cargo – whether gaseous, liquid or solid – e.g. by bulk carrier or tank ship, tank car or truck. For air freight, the more light-weight IATA-defined unit load device is used. In 1975, many containers still featured riveted aluminum sheet and post wall construction, instead of welded, corrugated steel. By the 1830s, railways across several continents were carrying containers that could be transferred to other modes of transport. The Liverpool and Manchester Railway in the United Kingdom was one of these. 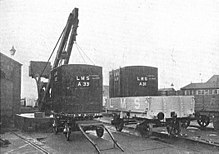 "Simple rectangular timber boxes, four to a truck, they were used to convey coal from the Lancashire collieries to Liverpool, where they were transferred to horse-drawn carts by crane." Early versions of standardized containers were used in Europe before World War II. Construction of these containers had a steel frame with wooden walls, floor, roof and doors. The first international standard for containers was established by the Bureau International des Containers et du Transport Intermodal (B.I.C.) in 1933, and a second one in 1935, primarily for transport between European countries. American containers at this time were not standardized, and these early containers were not yet stackable – neither in the U.S. nor Europe. In November 1932, the first container terminal in the world was opened by the Pennsylvania Rail Road Company in Enola, PA. The development of containerization was created in Europe and the US as a way to revitalize rail companies after the Wall Street Crash of 1929, in New York, which resulted in economic collapse and a drop in all modes of transport. In April 1951 at Zürich Tiefenbrunnen railway station, the Swiss Museum of Transport and the Bureau International des Containers (BIC) held demonstrations of container systems for representatives from a number of European countries, and from the United States. A system was selected for Western Europe, based on the Netherlands' system for consumer goods and waste transportation called Laadkisten (lit. "Loading bins"), in use since 1934. This system used roller containers for transport by rail, truck and ship, in various configurations up to 5,500 kg (12,100 lb) capacity, and up to 3.1 by 2.3 by 2 metres (10 ft 2 in × 7 ft 6 1⁄2 in × 6 ft 6 3⁄4 in) in size. This became the first post World War II European railway standard of the International Union of Railways – UIC-590, known as "pa-Behälter." It was implemented in the Netherlands, Belgium, Luxembourg, West Germany, Switzerland, Sweden and Denmark. 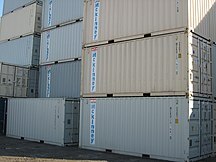 The use of standardized steel shipping containers began during the late 1940s and early 1950s, when commercial shipping operators and the US military started developing such units. In 1948 the U.S. Army Transportation Corps developed the "Transporter", a rigid, corrugated steel container, able to carry 9,000 pounds (4,100 kg). It was 8 ft 6 in (2.59 m) long, 6 ft 3 in (1.91 m) wide, and 6 ft 10 in (2.08 m) high, with double doors on one end, was mounted on skids, and had lifting rings on the top four corners. After proving successful in Korea, the Transporter was developed into the Container Express (CONEX) box system in late 1952. Based on the Transporter, the size and capacity of the Conex were about the same,[nb 3] but the system was made modular, by the addition of a smaller, half-size unit of 6 ft 3 in (1.91 m) long, 4 ft 3 in (1.30 m) wide and 6 ft 10 1⁄2 in (2.10 m) high. [nb 4] CONEXes could be stacked three high, and protected their contents from the elements. 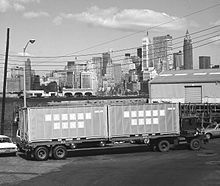 By 1965 the US military used some 100,000 Conex boxes, and more than 200,000 in 1967. making this the first worldwide application of intermodal containers. Their invention made a major contribution to the globalization of commerce in the second half of the 20th century, dramatically reducing the cost of transporting goods and hence of long-distance trade. From 1949 onwards, engineer Keith Tantlinger repeatedly contributed to the development of containers, as well as their handling and transportation equipment. In 1949, while at Brown Trailers Inc. of Spokane, he modified the design of their stressed skin aluminum 30-foot trailer, to fulfil an order of two-hundred 30 by 8 by 8.5 feet (9.14 m × 2.44 m × 2.59 m) containers that could be stacked two high, for Alaska-based Ocean Van Lines. Steel castings on the top corners provided lifting and securing points. In 1955 trucking magnate Malcom McLean bought Pan-Atlantic Steamship Company, to form a container shipping enterprise, later known as Sea-Land. The first containers were supplied by Brown, where McLean met Keith Tantlinger, and hired him as vice-president of engineering and research. Under the supervision of Tantlinger, a new 35 ft (10.67 m) x 8 ft (2.44 m) x 8 ft 6 in (2.59 m) Sea-Land container was developed, the length determined by the maximum length of trailers then allowed on Pennsylvanian highways. Each container had a frame with eight corner castings that could withstand stacking loads. Tantlinger also designed automatic spreaders for handling the containers, as well as the twistlock mechanism that connects with the corner castings. Every international shipping container must have a "CSC-Plate"
Two years after McLean's first container ship, the Ideal X started container shipping on the U.S. East Coast, Matson Navigation followed suit between California and Hawaii. Just like Pan-Atlantic's containers, Matson's were 8 ft (2.44 m) wide and 8 ft 6 in (2.59 m) high, but due to California's different traffic code, Matson chose to make theirs 24 ft (7.32 m) long. In 1968, McLean began container service to South Vietnam for the US military with great success. ISO standards for containers were published between 1968 and 1970 by the International Maritime Organization. These standards allow for more consistent loading, transporting, and unloading of goods in ports throughout the world, thus saving time and resources. The International Convention for Safe Containers is a 1972 regulation by the Inter-governmental Maritime Consultative Organization on the safe handling and transport of containers. It decrees that every container travelling internationally be fitted with a CSC Safety-approval Plate. This holds essential information about the container, including age, registration number, dimensions and weights, as well as its strength and maximum stacking capability. Longshoremen and related unions around the world struggled with this revolution in shipping goods. For example, by 1971 a clause in the International Longshoremen's Association (ILA) contract stipulated that the work of "stuffing" (filling) or "stripping" (emptying) a container within 50 miles of a port must be done by ILA workers, or if not done by ILA, that the shipper needed to pay royalties and penalties to the ILA. Unions for truckers and consolidators argued that the ILA rules were not valid work preservation clauses, because the work of stuffing and stripping containers away from the pier had not traditionally been done by ILA members. In 1980 the Supreme Court of the United States heard this case and ruled against the ILA. 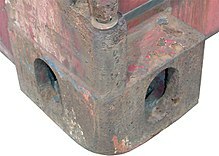 The standard castings on the eight corners of each container. The twistlock proper is done through a larger oval hole on the top or bottom. Ninety percent of the global container fleet consists of "dry freight" or "general purpose" containers – both of standard and special sizes. And although lengths of containers vary from 8 to 56 feet (2.4 to 17.1 m), according to two 2012 container census reports[nb 5] about 80% of the world's containers are either twenty or forty foot standard length boxes of the dry freight design. These typical containers are rectangular, closed box models, with doors fitted at one end, and made of corrugated weathering steel (commonly known as CorTen)[nb 6] with a plywood floor. Although corrugating the sheet metal used for the sides and roof contributes significantly to the container's rigidity and stacking strength, just like in corrugated iron or in cardboard boxes, the corrugated sides cause aerodynamic drag, and up to 10% fuel economy loss in road or rail transport, compared to smooth-sided vans. Standard containers are 8-foot (2.44 m) wide by 8 ft 6 in (2.59 m) high,[nb 7] although the taller "High Cube" or "hi-cube" units measuring 9 feet 6 inches (2.90 m) have become very common in recent years. By the end of 2013, high-cube 40 ft containers represented almost 50% of the world's maritime container fleet, according to Drewry's Container Census report. About 90% of the world's containers are either nominal 20-foot (6.1 m) or 40-foot (12.2 m) long, although the United States and Canada also use longer units of 45 ft (13.7 m), 48 ft (14.6 m) and 53 ft (16.15 m). ISO containers have castings with openings for twistlock fasteners at each of the eight corners, to allow gripping the box from above, below, or the side, and they can be stacked up to ten units high. [nb 8] Regional intermodal containers, such as European and U.S. domestic units however, are mainly transported by road and rail, and can frequently only be stacked up to three laden units high. Although the two ends are quite rigid, containers flex somewhat during transport. 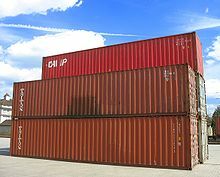 Container capacity is often expressed in twenty-foot equivalent units (TEU, or sometimes teu). A twenty-foot equivalent unit is a measure of containerized cargo capacity equal to one standard 20-foot (6.1 m) long container. This is an approximate measure, wherein the height of the box is not considered. For example, the 9 ft 6 in (2.9 m) tall high-cube, as well as 4-foot-3-inch half-height (1.3 m) 20-foot (6.1 m) containers are equally counted as one TEU. Similarly, extra long 45 ft (13.72 m) containers are commonly designated as two TEU, no different than standard 40 feet (12.19 m) long units. Two TEU are equivalent to one forty-foot equivalent unit (FEU). In 2014 the global container fleet grew to a volume of 36.6 million TEU, based on Drewry Shipping Consultants' Container Census. [nb 9] Moreover, in 2014 for the first time in history 40-foot High cube containers accounted for the majority of boxes in service, measured in TEU. Manufacturing prices for regular, dry freight containers are typically in the range of $1750—$2000 U.S. per CEU (container equivalent unit), and about 90% of the world's containers are made in China. The average age of the global container fleet was a little over 5 years from end 1994 to end 2009, meaning containers remain in shipping use for well over 10 years. Forty foot High-cube actively refrigerated container – refrigerating equipment visible on the front end. 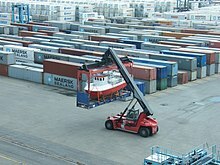 A flat-rack container loaded with a small vessel loaded by a reach stacker. Other than the standard, general purpose container, many variations exist for use with different cargoes. The most prominent of these are refrigerated containers (a.k.a. 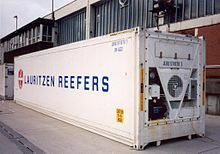 reefers) for perishable goods, that make up six percent of the world's shipping boxes. And tanks in a frame, for bulk liquids, account for another 0.75% of the global container fleet. Bulk containers (sometimes bulktainers), either closed models with roof-lids, or hard or soft open-top units for top loading, for instance for bulk minerals. Containerized coal carriers and "bin-liners" (containers designed for the efficient road and rail transportation of rubbish from cities to recycling and dump sites) are used in Europe. Open-top and open-side containers, for instance for easy loading of heavy machinery or oversize pallets. Crane systems can be used to load and unload crates without having to disassemble the container itself. Open sides are also used for ventilating hardy perishables like apples or potatoes. collapsible containers, ranging from flushfolding flat-racks to fully closed ISO and CSC certified units with roof and walls when erected. Containers for Offshore use have a few different features, like pad eyes, and must meet additional strength and design requirements, standards and certification, such as the DNV2.7-1 by Det Norske Veritas and the European standard EN12079: Offshore Containers and Associated Lifting Sets. A multitude of equipment, such as generators, has been installed in containers of different types to simplify logistics – see containerized equipment for more details. 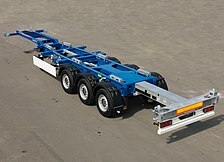 Swap body units usually have the same bottom corner fixtures as intermodal containers, and often have folding legs under their frame so that they can be moved between trucks without using a crane. However they frequently don't have the upper corner fittings of ISO containers, and are not stackable, nor can they be lifted and handled by the usual equipment like reach-stackers or straddle-carriers. They are generally more expensive to procure. Weights and dimensions of the most common standardized types of containers are given below. [nb 13] Values vary slightly from manufacturer to manufacturer, but must stay within the tolerances dictated by the standards. Empty weight (tare weight) is not determined by the standards, but by the container's construction, and is therefore indicative, but necessary to calculate a net load figure, by subtracting it from the maximum permitted gross weight. 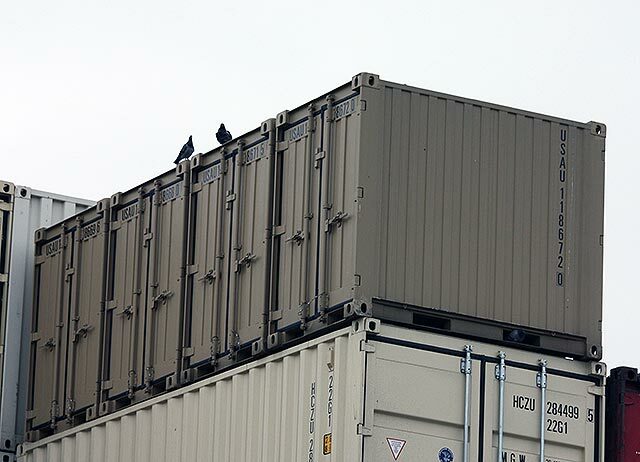 Forty-five-foot containers can be seen sticking out 2 1⁄2 feet (0.76 m), as part of the forty foot container stacks at the back of this ship. At stacking load-bearing locations, 40-foot containers are the standard unit length, and 45 ft, 48 ft, and 53 ft all stack at the 40 ft coupling width. Other units can be stacked on top of 20 ft units only if there are two in a row (40 ft coupling width) but 20 ft units can not be stacked on top of 40 ft units, or any other larger container. The coupling holes require a double male twist lock to securely mate stacked containers together. Pallet Wide containers have about 4 inches (10.2 cm) more internal floor width than standard containers to accommodate more Euro-pallets, common in Europe. These containers typically have an internal width of 2.44 m (96 1⁄8 in), to be able to load either two or three of the 1.2 m (47 1⁄4 in) long by 0.8 m (31 1⁄2 in) wide pallets side by side. 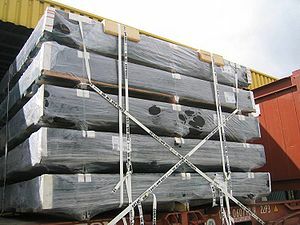 Many sea shipping providers in Europe allow these, as overhangs on standard containers are sufficient and they fit in the usual interlock spaces (or with the same floor panel the side ribs of pallet-wide containers are embossed to the outside instead of being molded to the inside). The 45 ft (13.72 m) pallet-wide high-cube container has gained particularly wide acceptance, as these containers can replace the 13.6 m (44 ft 7 3⁄8 in) swap bodies that are common for truck transport in Europe. The EU has started a standardization for pallet wide containerization in the European Intermodal Loading Unit (EILU) initiative. Australian RACE containers are also slightly wider to optimise them for the use of Australia Standard Pallets. The 48-foot (14.63 m) shipping container is a High Cube container in that it is 9 ft 6 in (2.90 m) tall on the exterior. It is 8 ft 6 in (2.59 m) wide which makes it 6 inches (15 cm) wider than ISO-standard containers. This size was introduced by container shipping company APL in 1986, and is used domestically in North America on road and rail, and may be transported on deck by ship. This size being 8 feet (2.44 m) longer and 6 inches (15 cm) wider has 29% more volume capacity than the standard 40-ft High Cube, yet the cost to move it by truck or rail are almost the same. 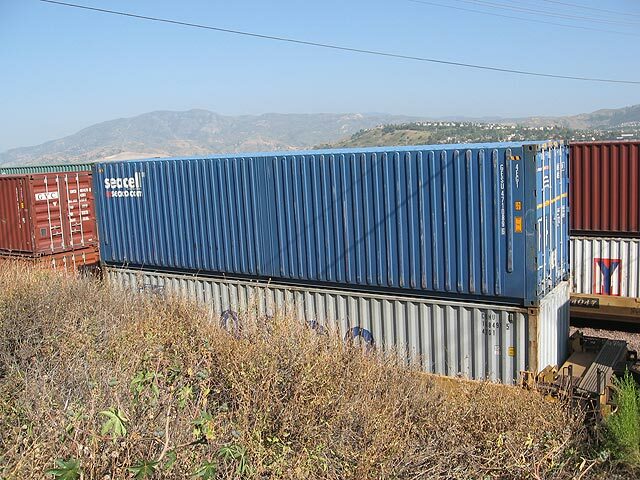 General purpose 53-foot (16.15 m) containers were introduced in the United States in 1989, and are used both in the U.S.A. and Canada, mainly for domestic road and rail transport. They are considered High-cubes, based on their 9 ft 6 in (2.90 m) ISO-standard height. Their width of 8 ft 6 in (2.59 m) however makes them 6 inches (15 cm) wider than ISO-standard containers. These large boxes have 60% more capacity than standard-height 40-foot (12.19 m) containers, enabling shippers to consolidate more cargo into fewer containers. Generally, North American 53-foot containers were not constructed strong enough to endure the rigors of ocean transport, but in 2007 container carrier APL introduced the first 53-foot ocean-capable containers. All new, reinforced 53-foot boxes were built specifically for international trade and designed to withstand ocean voyages on its South China-to-Los Angeles service. In 2013 however, APL stopped offering vessel space for 53-foot containers on its trans-Pacific ships. Nevertheless, In 2015 both Crowley and TOTE Maritime each announced the construction of their respective second combined container and roll-on/roll-off ships for Puerto Rico trade, with the specific design to maximize cubic cargo capacity by carrying 53-foot, 102-inch wide (2,591 mm) containers. Within Canada, Oceanex offers 53-foot-container ocean service to and from the island of Newfoundland. Fifty-three-foot containers are also being used on some Asia Pacific international shipping routes. In May 2017, Canadian Tire and Canadian Pacific Railway announced deployment of the first 60-foot intermodal containers in North America. The containers allow Canadian Tire to increase the volume of goods shipped per container by 13%. 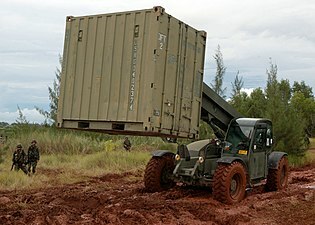 The United States military continues to use small containers, strongly reminiscent of their Transporter and Conex boxes of the 1950s and 1960s. These either comply with ISO standard dimensions, or are a direct derivative thereof. 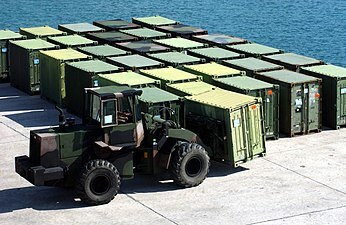 Current terminology of the United States armed forces calls these small containers Bicon, Tricon and Quadcon, which correspond with ISO 668 standard sizes 1D, 1E and 1F respectively. This comes down to containers of 8 ft (2.44 m) height, and with a footprint size either one half (Bicon), one third (Tricon) or one quarter (Quadcon) the size of a standard 20-foot, one TEU container. At a nominal length of 10 feet (3.0 m), two Bicons coupled together lengthwise match one 20-foot ISO container, but their height is 6 inches (15 cm) shy of the more commonly available 10-foot ISO containers of so-called standard height, which are 8 ft 6 in (2.59 m) tall. Tricons and Quadcons however have to be coupled transversely — either three or four in a row — to be stackable with twenty foot containers. Their length of 8 ft (2.44 m) corresponds to the width of a standard 20-foot container, which is why there are forklift pockets at their ends, as well as in the sides of these boxes, and the doors only have one locking bar each. The smallest of these, the Quadcon, exists in two heights: 96 in (2.44 m) or 82 in (2.08 m). Only the first conforms to ISO-668 standard dimensions (size 1F). U.S. Navy moving a Bicon box. Note the forklift pockets only in the sides, not at the ends. Tricon in truck bed for leaf collection or wood chips catcher. Each container is allocated a standardized ISO 6346 reporting mark (ownership code), four letters long ending in either U, J or Z, followed by six digits and a check digit. The ownership code for intermodal containers is issued by the Bureau International des Containers (International container bureau, abbr. B.I.C.) in France, hence the name BIC-Code for the intermodal container reporting mark. So far there exist only four-letter BIC-Codes ending in "U". The placement and registration of BIC Codes is standardized by the commissions TC104 and TC122 in the JTC1 of the ISO which are dominated by shipping companies. Shipping containers are labelled with a series of identification codes that includes the manufacturer code, the ownership code, usage classification code, UN placard for hazardous goods and reference codes for additional transport control and security. Following the extended usage of pallet-wide containers in Europe the EU started the Intermodal Loading Unit (ILU) initiative. This showed advantages for intermodal transport of containers and swap bodies. This led to the introduction of ILU-Codes defined by the standard EN 13044 which has the same format as the earlier BIC-Codes. The International Container Office BIC agreed to only issue ownership codes ending with U, J or Z. The new allocation office of the UIRR (International Union of Combined Road-Rail Transport Companies) agreed to only issue ownership reporting marks for swap bodies ending with A, B, C, D or K – companies having a BIC-Code ending with U can allocate an ILU-Code ending with K having the same preceding letters. Since July 2011 the new ILU codes can be registered, beginning with July 2014 all intermodal ISO containers and intermodal swap bodies must have an ownership code and by July 2019 all of them must bear a standard-conforming placard. Containers are transferred between rail, truck, and ship by container cranes at container terminals. Forklifts, reach stackers, straddle carriers, and cranes may be used to load and unload trucks or trains outside of container terminals. Swap bodys, sidelifters, tilt deck trucks, and hook trucks allow transfer to and from trucks with no extra equipment. 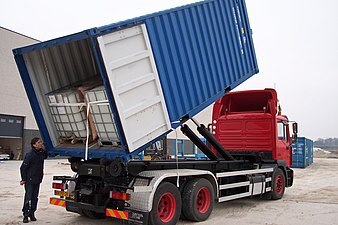 ISO-standard containers can be handled and lifted in a variety of ways by their corner fixtures, but the structure and strength of 45-foot (type E) containers limits their tolerance of side-lifting, nor can they be forklifted, based on ISO 3874 (1997). Containers can be transported by container ship, truck and freight trains as part of a single journey without unpacking. Units can be secured in transit using "twistlock" points located at each corner of the container. Every container has a unique BIC code painted on the outside for identification and tracking, and is capable of carrying up to 20–25 metric tons. Costs for transport are calculated in twenty-foot equivalent units (TEU). 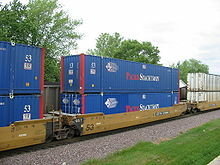 A portion of a "double stack" container train operated by Union Pacific Railroad, the containers are owned by Pacer Stacktrain, the well cars by TTX. About 90% of non-bulk cargo worldwide is transported by container, and the largest container ships can carry over 19,000 TEU (Twenty-Foot Equivalent, or how many 20 foot containers can fit on a ship). Between 2011 and 2013, an average of 2,683 containers were reported lost at sea. Other estimates go up to 10,000; of these 10% are expected to contain chemicals toxic to marine life. Containers can also be transported in planes, as seen within intermodal freight transport. However, transporting containers in this way is typically avoided due to the cost of doing such and the lack of availability of planes which can accommodate such awkwardly sized cargo. There are special aviation containers, smaller than intermodal containers, called Unit load devices. There are many established methods and materials for stabilizing and securing intermodal containers loaded on ships, as well as the internal cargo inside the boxes. Conventional restraint methods and materials such as steel strapping and wood blocking and bracing have been around for decades and are still widely used. Polyester strapping and lashing, and synthetic webbings are also common today. Dunnage bags (also known as "air bags") are used to keep unit loads in place. Flexi-bags can also be directly loaded, stacked in food-grade containers. Indeed, their standard shape fills the entire ground surface of a 20' ISO container. Intermodal containers which contain valuables can be the target of break-ins and burglary when left unattended. In these cases, the container may be fitted with a security system consisting of a motion detector and panel inside the container. The panel can trigger a siren, strobe, or light to deter intruders, or use a radio signal to alert security guards. Items that were packed incorrectly may come loose and cause a false response from an inside motion detector. If criminals break in by cutting through a wall of the container, the obstructed motion detector becomes useless. Tomographic motion detectors work well in intermodal containers because they do not require a line of sight to detect motion. The entire container is covered by a volumetric sensing mesh that is not blocked by equipment or inventory. Tomographic motion detection is not prone to misdetection due to dirt buildup as is the case for beams and infrared sensors. Container-sized units are also often used for moving large pieces of equipment to temporary sites. Specialised containers are particularly attractive to militaries already using containerisation to move much of their freight around. Shipment of specialized equipment in this way simplifies logistics and may prevent identification of high value equipment by enemies. Such systems may include command and control facilities, mobile operating theatres or even missile launchers (such as the Russian 3M-54 Klub surface-to-surface missile). Complete water treatment systems can be installed in containers and shipped around the world. Electric generators can be permanently installed in containers to be used for portable power. 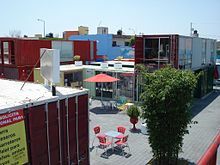 Container City in Cholula, Mexico uses fifty old sea containers for 4,500 m2 (48,000 sq ft) of workshops, restaurants, galleries, etc., as well as some homes. Half the containers that enter the United States leave empty. Their value in the US is lower than in China, so they are sometimes used for other purposes. This is typically but not always at the end of their voyaging lives. The US military often used its Conex containers as on-site storage, or easily transportable housing for command staff and medical clinics. Nearly all of over 150,000 Conex containers shipped to Vietnam remained in the country, primarily as storage or other mobile facilities. Permanent or semi-permanent placement of containers for storage is common. A regular forty-foot container has about 4,000 kg (8,818 lb) of steel, which takes 8,000 kWh (28,800 MJ) of energy to melt down. Repurposing used shipping containers is increasingly a practical solution to both social and ecological problems. Shipping container architecture employs used shipping containers as the main framing of modular home designs, where the steel may be an integrated part of the design, or be camouflaged into a traditional looking home. They have also been used to make temporary shops, cafes, and computer datacenters, e.g., the Sun Modular Datacenter. 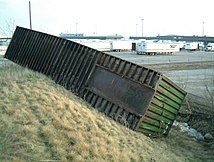 Intermodal containers are not strong enough for conversion to underground bunkers without additional bracing, as the walls cannot sustain much lateral pressure and will collapse. Also, the wooden floor of many used containers could contain some fumigation residues, rendering them unsuitable as confined spaces, such as for prison cells or bunkers. Cleaning or replacing the wood floor can make these used containers habitable, with proper attention to such essential issues as ventilation and insulation. ^ Based on size alone, at least 5% of intermodal containers do not comply with ISO standards, and should technically not be called ISO containers. ^ Some sources also mention a 12-foot version. ^ Using "standard" to mean 'standard height', as intended within the ISO 668 standard, as opposed to meaning dry van or general purpose container. 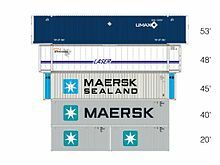 ^ Although ISO standard 1496 of 1990 only required nine-high stacking, and only of containers rated at 24,000kg, current Ultra Large Container Vessels of the Post New Panamax and Maersk Triple E class are stacking them ten or eleven high. ^ Infrequently there are two sets, an outer set which may be used for loaded handling, and an inner set only for unloaded handling, by smaller forklifts. ^ Frequently used abbreviations for the most common ISO 6346 types are: GP (General Purpose), HC / HQ (High Cube), OT (Open Top), RF (Refrigerated), RK (Rack) and TK (Tank). ^ The term "Series 1" in the standards names expresses the interrelated nature of the standards, leaving room for another such series in the future. In fact, in 2012 Michel Hennemand, president of the International Container Bureau (BIC), and chair of ISO Technical committee 104, subcommittee SC 1: General purpose containers, asked whether the time has come to develop a new series of standards on containers (Series 2), to accommodate new sizes like American 53-foot and European Pallet-wide containers. A new series which, given the significant investments required by the industry, would replace the current series of standards (series 1) in the next 20 or 25 years. ^ Forty-five-foot containers were not standardized by the ISO until the 2005 Amendment No. 2 to the ISO 668:1995 standard. ^ a b c d Dr. Jean-Paul Rodrigue. "World Container Production, 2007". The Geography of Transport Systems. Hofstra University. Archived from the original on 4 July 2013. Retrieved 19 July 2015. ^ a b c d e "Global Container Fleet". www.worldshipping.org. World Shipping Council. 2013. Archived from the original on 11 May 2015. Retrieved 19 July 2015. ^ a b c d e f "World Container Fleet Overview". csiu.co. CSI Container Services International. January 2014. Archived from the original on 18 July 2015. Retrieved 18 July 2015. ^ a b Container Supply Review (PDF) (Report). World Shipping Council. May 2011. p. 1. Retrieved 18 July 2015. ^ "Container Shipping – Statistics & Facts". Statista.com. Statista Inc. Archived from the original on 5 December 2014. Retrieved 27 July 2015. ^ "Frequently Asked Questions - Modeling Eras". 14 August 2015. Archived from the original on 14 August 2015. ^ Lewandowski, Krzysztof (2014). "Czechoslovak activity to prepare European norms for containers before the Second World War" (PDF). Acta Logistica. 1 (4): 1–7. ISSN 1339-5629. ^ Nico Spilt. "Laadkistvervoer – Langs de rails" [Loading bin transport] (in Dutch). Archived from the original on 20 July 2015. Retrieved 20 July 2015. ^ Lewandowski, Krzysztof (2014). "Wymagania Organizacyjne Stosowania Systemu ACTS" [Organizational Requirements Use the ACTS System] (PDF). Pojazdy Szynowe (in Polish). 2: 1–14. ISSN 0138-0370. ^ Intermodal Marine Container Transportation: Impediments and Opportunities, Issue 236 // National Research Council: The container revolution (page 18): "This [Army] box in turn served as a model for the small containers that most major ship operators began using during the late 1940s and early 1950s. These however, were mainly loaded and unloaded at the docks, and not used intermodally.."
^ "History & Development of the Container – The "Transporter", predecessor to the CONEX". www.transportation.army.mil. U.S. Army Transportation Museum. 15 May 2013. Archived from the original on 20 July 2015. Retrieved 20 July 2015. ^ a b Logistic Support in the Vietnam Era (PDF) (Report). 7: Containerization. US DoD Joint Logistics Review Board. 15 December 1970. pp. 9–11. Retrieved 22 July 2015. ^ Van Ham, Hans; Rijsenbrij, Joan (15 December 2012). Development of Containerization. Amsterdam: IOS Press. p. 14. ISBN 978-1614991465. Retrieved 27 July 2015. ^ Van Ham, Hans; Rijsenbrij, Joan (15 December 2012). Development of Containerization. Amsterdam: IOS Press. p. 18. ISBN 978-1614991465. Retrieved 14 August 2015. ^ Van Ham, Hans; Rijsenbrij, Joan (15 December 2012). Development of Containerization. Amsterdam: IOS Press. p. 20. ISBN 978-1614991465. Retrieved 14 August 2015. ^ Van Ham, Hans; Rijsenbrij, Joan (15 December 2012). Development of Containerization. Amsterdam: IOS Press. p. 26. ISBN 978-1614991465. Retrieved 14 August 2015. ^ Bartsch, Butsri. "Sea freight – somehow antique yet modern!". Archived from the original on 4 June 2013. Retrieved 20 May 2013. ^ "International Convention for Safe Containers (CSC) – Adoption: 2 December 1972; Entry into force: 6 September 1977". Imo.org. Retrieved 1 February 2013. ^ "Shipping Container Homes Globally". Retrieved 24 May 2009. ^ "Miles to Go - Running Green content from Fleet Owner". 26 July 2015. Archived from the original on 26 July 2015. ^ a b ISO 668:1995 Series 1 freight containers – Classification, dimensions and ratings – AMENDMENT 2: 45' containers (Technical report). ISO. 2005. Archived from the original on 6 March 2016. Retrieved 9 September 2017. ^ "40ft High Cubes set to Dominate the Container Equipment Market". Drewry Shipping Consultants. 18 June 2014. Archived from the original on 29 August 2014. Retrieved 18 July 2015. ^ a b c "Composition of the Global Fleet of Containers, 2008". The Geography of Transport Systems. Hofstra University. Archived from the original on 21 November 2014. Retrieved 18 July 2015. ^ a b "Section 3.1 Container design". Container Handbook. GDV, the collective of German insurance companies. Archived from the original on 13 May 2015. Retrieved 27 July 2015. ^ ISO 1496-1: Series 1 Freight Containers – Specification and Testing (PDF) (Technical report). ISO. 1990. pp. 4–5. Part 1. Archived from the original (PDF) on 29 March 2014. ^ Dr. Jean-Paul Rodrigue (2013). "Evolution of Containerships". The Geography of Transport Systems. Hofstra University. Archived from the original on 22 March 2015. Retrieved 27 July 2015. ^ "The Triple-E A larger-than-life puzzle". 5 September 2014. Archived from the original on 5 September 2014. ^ "GTRI Develops New Technologies to Secure Cargo Containers". PhysOrg.com. 7 September 2009. Retrieved 8 May 2011. 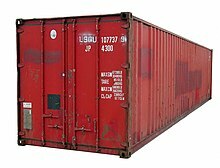 ^ "20 Foot Container Dimensions, 20' Ft Containers Sizes". Shippingcontainers24.com. Archived from the original on 17 January 2013. Retrieved 1 February 2013. ^ a b Mike Wackett (7 July 2015). "Price of new containers at a 10-year low". www.wcaworld.com. The Loadstar. Archived from the original on 18 July 2015. Retrieved 18 July 2015. ^ Wackett, Mike (7 June 2015). "Price of new containers at a 10-year low, putting pressure on leasing companies". The Loadstar. London, U.K. Archived from the original on 23 July 2015. Retrieved 23 July 2015. ^ ISO 1496-1: Series 1 Freight Containers – Specification and Testing (PDF) (Technical report). ISO. 1990. pp. 8, 13, 20. Part 1. Archived from the original (PDF) on 29 March 2014. ^ "Selecting a Container" (PDF). CMA CGM Group. 2006. Archived from the original (PDF) on 11 January 2007. Retrieved 14 February 2008. ^ "Garmentainers". OOCL.com. Orient Overseas Container Line. Archived from the original on 5 March 2010. ^ "DB Schenker Logistics offers new solution for garments on hangers | 3PL". 3plnews.com. 7 July 2010. Retrieved 1 February 2013. ^ Jacob, Munden (14 August 2018). "Why Open-Top Containers Dominate the Glass Industry and How to Use Them To Streamline Your Shipping". barrettlimited.com. ^ "Economic Analysis of Proposed Standardisation And Harmonisation Requirements" (PDF). ICF Consulting, Ltd. 13 October 2003. Archived from the original (PDF) on 11 October 2010. ^ a b Hennemand, Michel (April 2012). "Containers – Talk about a revolution !". ISO Focus+. 3 (4): 21–22. Archived from the original on 18 July 2015. Retrieved 13 July 2015. ^ Frederik Hallbjörner, Claes Tyrén (2004). "Possible consequences of a new European container standard (EILU)" (PDF). master thesis. ^ a b "Container Dimensions 48' and 53'". PNW Equipment. Archived from the original on 5 October 2014. ^ a b c Crowe, Paul (2 November 2007). "APL Introduces 53 Foot Ocean Containers". Export Logistics Guide. Archived from the original on 4 November 2013. Retrieved 25 July 2015. ^ a b Dr. Jean-Paul Rodrigue (2006). "Carrying Capacity of Containers (in cubic feet)". The Geography of Transport Systems. Hofstra University. Archived from the original on 3 September 2013. Retrieved 25 July 2015. ^ "53ft High Cube Container | 53' High Cube Container | Container Technology, Inc". 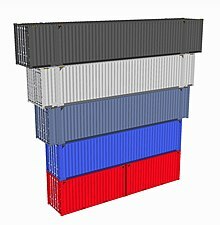 Containertech.com. Retrieved 1 February 2013. ^ "Big Boxes bring Big Questions – Eric Joiner's Freightdawg.com – The Logistics and Supply Chain Blog!". Freightdawg.com. 5 November 2007. Retrieved 1 February 2013. ^ JOC staff (15 March 2013). "APL Abandons 53-Foot Ocean Containers". The Journal of Commerce. Newark, NJ, U.S. Archived from the original on 15 May 2013. ^ "Construction Begins on Crowley's Second Commitment Class ConRo Ship for Use in the Puerto Rico Trade". Hellenic Shipping News Worldwide. Piraeus, Greece. 28 May 2015. Archived from the original on 24 July 2015. Retrieved 24 July 2015. ^ "Containers for world's first LNG-powered container ships arrive at Jaxport". Jacksonville, FL, USA: Jacksonville Port Authority. 16 June 2015. Archived from the original on 24 July 2015. Retrieved 24 July 2015. ^ "Oceanex Invests $8 Million to Expand its Refrigerated Services". Retrieved 26 December 2015. ^ "Canadian Pacific and Canadian Tire Corporation Deploy North America's First 60-foot Intermodal Container". 27 April 2017. Retrieved 3 May 2017. ^ "New markings of intermodal loading units in Europe" (PDF). International Union of Combined Road-Rail Transport Companies. 10 May 2011. ^ Raghvendra, Rao (26 August 2008). "Rlys reaches higher, sets world record". IndianExpress.com. Retrieved 4 November 2009. ^ "World Shipping Council Containers Lost at Sea 2014 Update" (PDF). 2014. ^ "Scientists to study effects of shipping containers lost at sea". 9 March 2011. ^ ""operating Room in a Box" Unfolds". 9 September 2004. Archived from the original on 3 September 2016. Retrieved 2015-05-18. ^ Correspondent, Thomas Harding (25 April 2010). "A cruise missile in a shipping box on sale to rogue bidders". Archived from the original on 23 March 2016. Retrieved 2010-04-26. ^ "Water treatment in container". Archived from the original on 19 October 2016. Retrieved 2015-01-31. ^ "Glossary of Military Terminology". Archived from the original on 23 February 2015. Retrieved 21 July 2015. 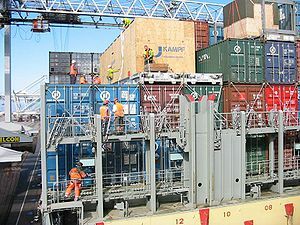 Wikimedia Commons has media related to Intermodal containers.